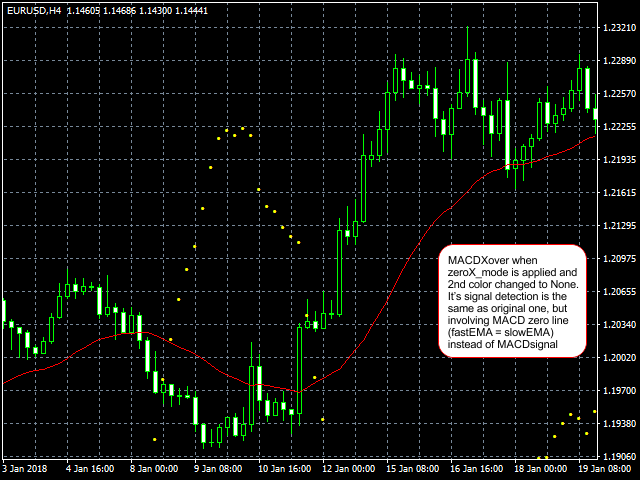 This indicator helps you to find price that may cause MACD Signal crossover on the current bar.. These crossover points are depicted in form of stars (like Parabolic SAR). 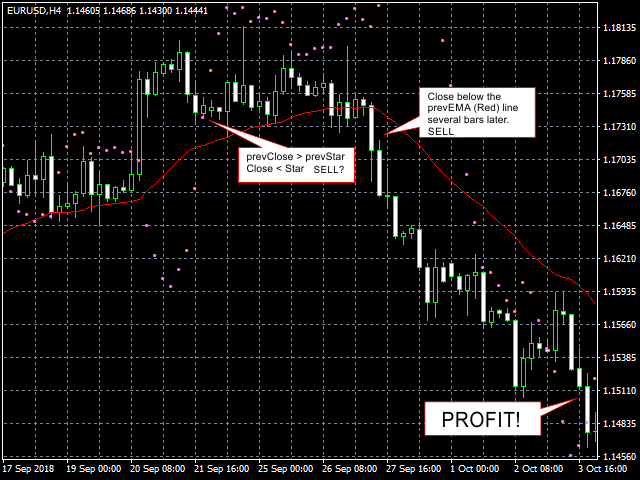 prevEMA line also helps you to decide the trend. Get 20% OFF for rents for 1 year! MACDSignalStars (Violet) stars displayed are the the prices that make the MACDmain = MACDsignal. If the close price is higher than the star, then MACDmain > MACD signal. If the close price is lower than the star, then MACDmain < MACD signal. Previous Close is lower than Previous Star. Current Close is higher than Current Star. Current Close is above the prevEMA line several bars later. Both Stars are not below the candles inspected. Previous Close is higher than Previous Star. Current Close is lower than Current Star. Current Close is lower the prevEMA line several bars later. Both Stars are not above the candles inspected. 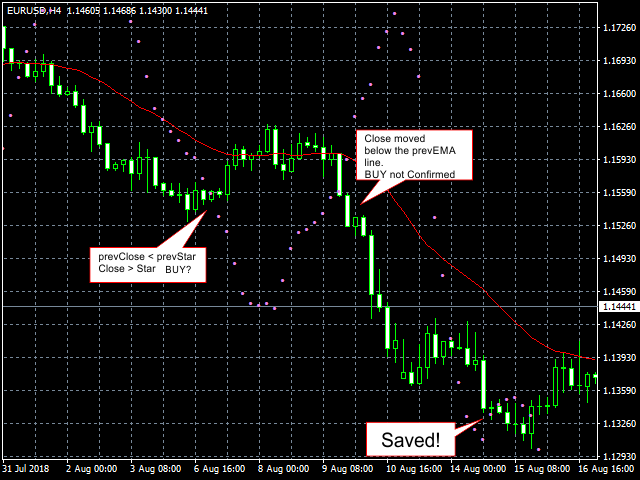 MA_Period_short: Fast EMA used for MACD. Must be larger than 1. MA_Period_long: Slow EMA used for MACD. Must be larger than MA_Period_short. zeroX_mode: In addition of MACD Signal crossover, the program also draw MACD Zero crossover points. applied_price: Prices to be applied to the indicator. You can apply Close, High, or Low price. prevEMA: A long-term EMA that shifted by 1 bar forward. Use this to confirm signals generated by this indicator. MACDSignalStars: MACD-Signal Crossover points. The main indicator. MACDZeroStars: MACD-Zero Crossover points. Not used by default. It's signal interpretation is similar to BUY and SELL signal given above. Now you can apply High/Low prices as an input, instead of Close price only. Description rewrited, and now star size is adjustable. Now the indicator will notify you when there are inputs has invalid values (and also repair them).